But we need these paradigms in other areas, too. 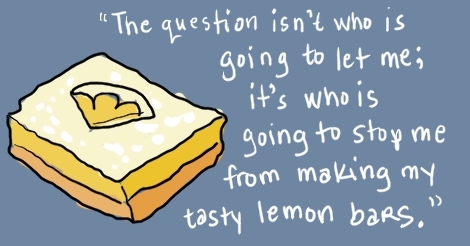 Consider baking. Many of us know it as an activity that must be done well or else you don’t make it to the finals of the TV show, but baking is also the source of the food we eat that we know as “not beef.” Bread, for example, is baked! Technically even at Subway! But what do we really know about making treats from flower, fat, and sugar? Who can guide us through the often terrifying mysteries of where cakes come from and there are TV shows about making them into scale models of Ferraris and the Battle of Antietam? Worry not, gentle reader, for I have been through the lost papers of some philosophers, and they have left us recipes that show us the meaning of raspberry tarts through the lenses how how they regarded life! 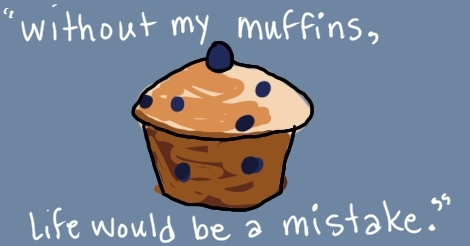 Embrace the conflict between what I am telling you muffins should be, and what you think they are. By following this recipe, you accept my will to muffins. Step One: Preheat oven to 400 degrees F (200 degrees C). Grease muffin cups or line with muffin liners. Deny the false god of a muffin pan, as it aims to force rigid structures upon the forms of the baked treats that are in conflict with what they are and their own personal truth. Step Two: Combine with the power and confidence of the Übermensch 1 1/2 cups flour, 3/4 cup sugar, salt and baking powder. Place vegetable oil into a 1 cup measuring cup; add the egg and enough milk to fill the cup. Ponder what diseases and misconceptions of society caused it to decide that this volume, and no other, make this a “cup.” Mix this with flour mixture. Fold in blueberries. Eat some to find your truth of blueberries. Fill muffin cups right to the top, and sprinkle with crumb topping mixture. Step Three: To Make Crumb Topping: Mix together 1/2 cup sugar, 1/3 cup flour, 1/4 cup butter, and 1 1/2 teaspoons cinnamon. They are not fundamentally incompatible, unlike what you and I respectively see when we look at a bakery. Mix with fork, and sprinkle over muffins before baking. Step Four: Bake for 20 to 25 minutes in the preheated oven, or until 10 minutes before blackened. Step One: Beat together butter, sugar, and eggs by flailing your arms in the manner of the blind idiot god who created you. Step Two: Dissolve baking soda into the pointless tears wept from the futile effort of your will to find meaning in a chaotic existence. add to batter. Step Three: Stir in flour and chocolate chips. Add a few raisins and caramelized onions as no one should expect more from life than dashed hopes. Step Four: Drop large spoonfuls on ungreased cookie sheets and put into oven at 350 degrees. Spend next ten minutes watching the dough face its crucible as you reflect on how he we face a much longer, crueler one. Come to embrace the existential ennui. 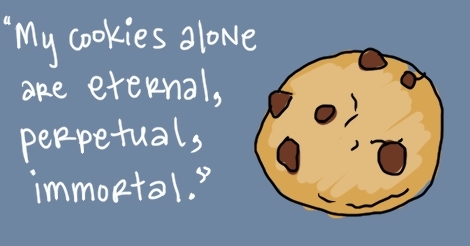 Recipe serves none, as cookies have no meaning. Step One: Preheat oven to 350 degrees F (175 degrees C). It is difficult, but not impossible, to achieve this heat from the flames of burning religious texts. Step Two: In a medium bowl, blend together softened butter, 2 cups flour and 1/2 cup sugar. Press into the bottom of an ungreased 9×13 inch pan. One might think that each ingredient should stand alone from the others in enlightened self-interest, but they combine and homogenize in the free trade of essences. Step Three: Bake for 15 to 20 minutes in the preheated oven, or until firm and golden. In another bowl, whisk together the remaining 1 1/2 cups sugar and 1/4 cup flour. Whisk in the eggs and lemon juice. Pour over the baked crust. Do this alone, as you cannot trust that it will be in the self-interest of others to aid rather than sabotage you. Step Four: Bake for an additional 20 minutes in the preheated oven. The bars will firm up as they cool. For a festive tray, make another pan using limes instead of lemons and adding a drop of green food coloring to give the very pale green color of American cash. After both pans have cooled, cut into uniform 2 inch squares and arrange in a checkerboard fashion. Serves as many as your sickening altruism will allow to grasp at the crumbs you leave behind.